From Lander drive north on US Hwy 287 to Fort Washakie, about 14 miles. Turn left (west) at the Sinclair gas station. Follow N. Fork Rd for a half-mile, then bear left onto S. Fork Rd. Drive a quarter-mile, then bear right to continue on S. Fork Rd. Drive one mile. Turn left onto Cemetery Lane. You’ll see the cemetery ahead on the right. The statue is easy to spot; the grave is the tall tombstone near the log cabin. 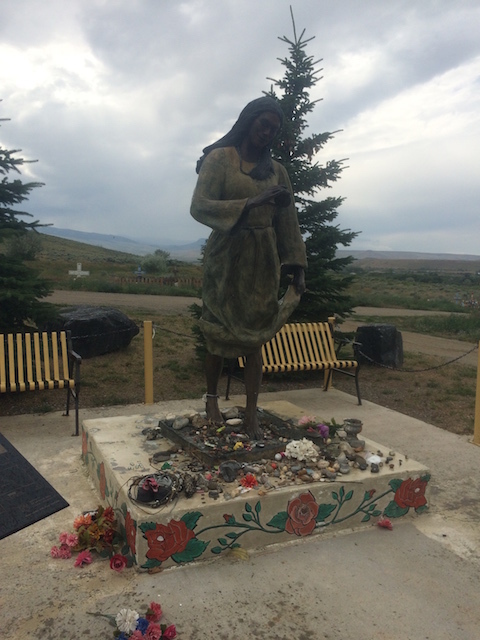 If your heart is set on finding Sacagawea resting place, don’t give up. It’s a nice cemetery with and astounding amount of over grown weeds, and some beautiful airbrushed crosses. 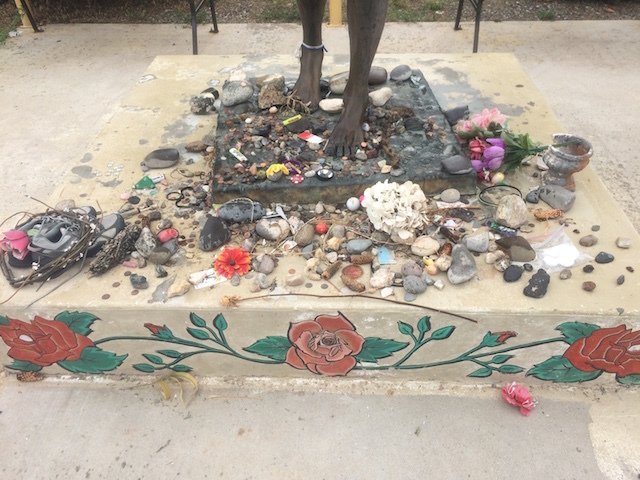 There is a statue to represent her life, a few historical marker and lot of gifts left behind from those who have visited, like a Disney smashed quarter, flowers, and even a shoes. The Shoshone Indian have no proof that she was really buried here but these are the lands of her native people. The historical signs state her gravestone is midway down the cemetery to the east or west, along with those of her son Baptistte and her adopted son Brazil. Also on the grounds of the cemetery is a small log building which was the first school for Indians, built in 1878. This entry was posted in Geography USA/World, History, Unschooling and tagged geography, History, lewis and clark, Roadside Trivia, Sacajawea, USA history, Wyoming by Chrissie. Bookmark the permalink.